Someone told me that today. What does it mean? And, is that correct? Give more detail/context. That could be reference to a few different things, some of which are generally considered outdated. Maybe in a Coaching Clinic. i.e. Have the barrel work around the ball so you can hit ground balls to players in practice. It means that they do not know what they are talking about. And, no, respectively. If I'm giving him the benefit of the doubt, I'm guessing that he's talking about not casting. When you cast, your shoulders are rotating early, the hands get out away from the body, and the bat drags through the zone (tip of barrel behind the hands if viewed perpendicular to batter). By contrast, getting the barrel around the ball means the end of the bat is ahead of the hands at contact. The idea being that the upper body is still tightly connected to the core, and the hitter is maximizing his rotational speed. No one that I pay attention to would use that terminology. I'm also not sure what you mean by "follow through the ball." Remember, all the baseball physicists have concluded that the bat has almost zero impact on the ball after the moment of contact. A powerful batter is not propelling the ball with his follow through after contact, it's all about the speed and mass of the bat at impact. Now getting the barrel in the zone and on plane with the pitch and keeping it there as long as possible is important, but I don't equate that with follow through. That's not much context. The most common teach these days is "stay inside and on plane". Occasionally, you will see a batter hook around a ball in a defensive effort to put a tough pitch in play or as a result of being fooled on an off-speed pitch but definitely not a mechanical teach. Decades ago, many players would release the top hand earlier, trying to generate bat speed more with wrists, with the perception that they were reaching full extension at contact. Often, the result of being a hair early was barrel getting around the ball. Not desirable. Curious... are you talking to an instructor? Coach? Parent? Age? Answer is no. As I often state, I am an ex expert. I find that today "experts" are a dime a dozen and many if not most are clueless. So, I'd rather just settle with being an ex expert. Cues have to be explained and demonstrated. Tell em, show em, let em. A cue I find that works the best for me and my hitters is to point the knob and deliver the barrel. I coach with "restraints" where I want the hitter to have a sense of measurements in their swing. I do a lot of work trying to get my hitters understand and control the lag position and just before what many call the "go position." I believe in a hitter's hands coming into a relationship with that back shoulder for a very small period of time and then coming off. I have a different way of describing that action than most and I'll keep it at that. Keep in mind that I have been on this website for a very long time and for a very long time under a different name. I was around and survived the hitting wars. I'm still at it which says a lot given how ruthless that age was. Exactly. If you don't know, then they don't know. If they can't explain it to you, then how would a kid know what to do with that? Most hitting/pitching instruction is bad/wrong/destructive. Dads, don't put up with this nonsense. Think for yourself. Is the cue what MLB hitters actually do in games? I think, now, maybe they were trying to tell me that you have to turn the barrel. That's like saying the sky is blue. Of course you turn the barrel. The 64 million answer is when and how. You want to turn it early. You can't turn it early by pushing the hands, pushing the knob, extending your arms, using the fence drill, or two tee drill. Place a ball on the tee with the horseshoe on the bottom and on top. You now have the two seams lined up North/South. Try to hit the inside seam. If you hit the outside seam, you are swinging around the ball which is incorrect. Try to hit the inside seam. The biggest problem most hitters have is they don't get the bat head in front of the hands, until after contact. This drill would make this problem worse. 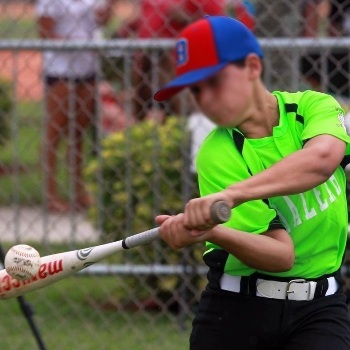 If you push the hands, or bat drag (which is what 99% of youth do), the bat head will stay behind the hands longer than it should, and you will hit the inside of the ball.